The online version of this article ( https://doi.org/10.1186/s40425-019-0565-5) contains supplementary material, which is available to authorized users. Dendritic cell (DC) vaccines may elicit and improve anti-cancer CD8+ T cell immunity [5, 6]. However, the use of DCs for tumor immunotherapy has been limited so far, being the only FDA-approved therapy the blood antigen (Ag)-presenting cell-based vaccine Sipuleucel-T for metastatic castration-resistant prostate cancer . Currently, most clinical efforts focus on human blood monocyte-derived DCs (moDCs) cultured for several days with GM-CSF and IL-4, loaded with various Ags and stimulated with proinflammatory adjuvants [6, 8, 9, 10]. Numerous clinical trials are ongoing that test the efficacy of moDC-based vaccination against different types of cancer as single agents or combination therapies. 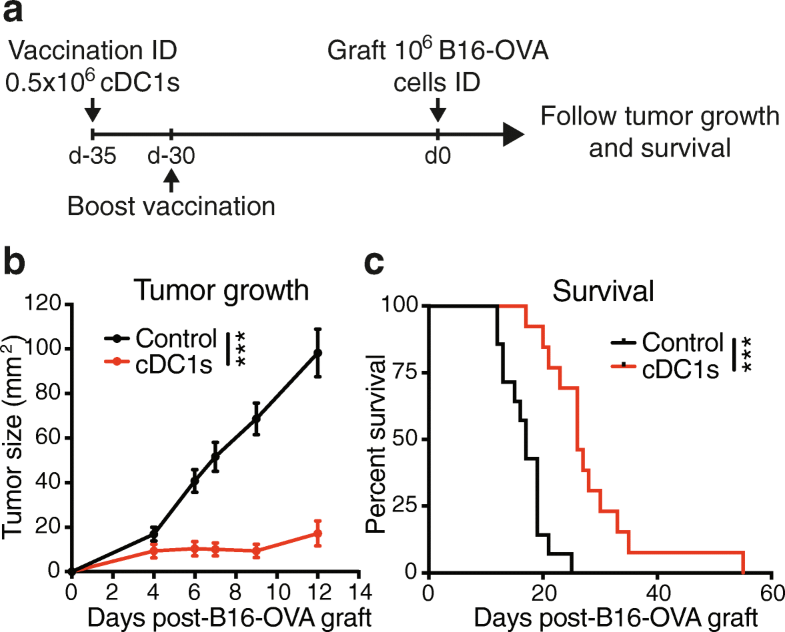 Combination of DC vaccination and immune checkpoint inhibitors appears especially promising, as both target enhanced mobilization and activity of anti-cancer CD8+ T cells [5, 6, 11]. In general, adoptive transfer of ex vivo-treated DCs to cancer patients demonstrated an excellent safety profile, but the efficacy did not meet the expectations yet . 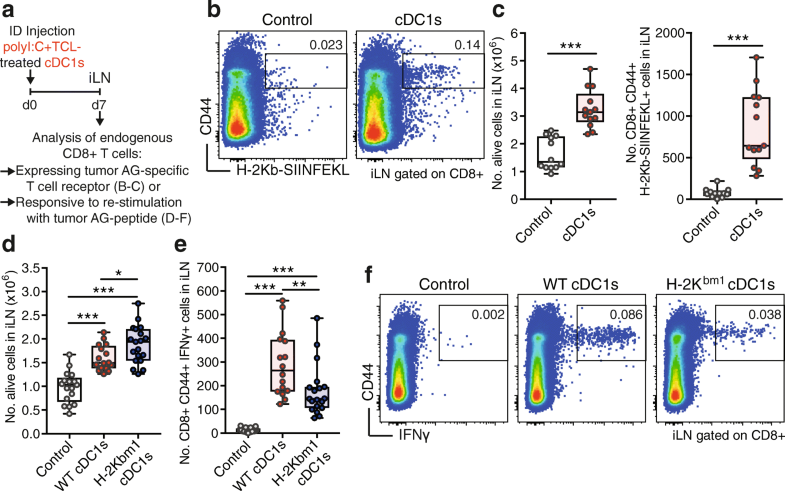 Human cDC1s (DNGR-1/CLEC9A+, XCR1+) and their mouse equivalents (DNGR-1/Clec9a+, Xcr1+, also expressing CD8 in lymphoid organs) are strong inducers of CD8+ T cell responses due to their superior capacity for uptake of dying or dead cell material and processing of cancer cell-associated Ags for cross-presentation [18, 19, 20, 21, 22]. Moreover, cDC1s are the main cellular source of IL-12 , a fundamental cytokine for anti-cancer CD8+ CTL activation . Those functional traits support the notion that cDC1s are the superior DC subset for induction of anti-tumor immunity [25, 26]. Indeed, Batf3-dependent cDC1s are needed to mount anti-tumor CD8+ T cell responses at baseline  or upon poly I:C therapy  and are indispensable for efficacy of immune checkpoint blockade [28, 29]. Moreover, cDC1s are critical for the transport of intact tumor-Ag to lymph nodes (LNs) to elicit anti-tumor T cell activation [29, 30] and the secretion of CXCL9/10 by tumor-infiltrating cDC1s is crucial for the recruitment of CD8+ T cells into tumors . Moreover, a variety of studies show that presence of cross-presenting BDCA3+ cDC1s or their gene signatures in the tumor correlates with enhanced T cell infiltration, improved prognosis and survival of cancer patients [26, 30, 32, 33]. Comparative transcriptional and functional analyses have established that mouse spleen CD8α+ cDC1s are the equivalents of human circulating BDCA3+ cDC1s [18, 19, 20, 21]. Therefore, we used naturally occurring mouse spleen CD8α+ cDC1 in order to test the suitability of cDC1s as basis for effective cancer therapy. Human anti-cancer DC vaccines are based on autologous DCs obtained from the cancer patient . To reproduce this situation in our pre-clinical setting while expanding cDC1s, mice were grafted with B16 melanomas that secrete FMS-like tyrosine kinase 3 ligand (FLT3L) (B16-FLT3L) . CD11c+ MHC-II+ CD8α+ cDC1s isolated from the spleen of both steady-state and B16-FLT3L tumor-bearing donor mice showed similar patterns of surface markers, including high XCR1, CD205, Clec9A and CD24, as well as no/low CD11b and SIRPα expression (Additional file 1: Figure S1), suggesting no major phenotypic alteration of cDC1s in B16-FLT3L tumor-bearing mice. 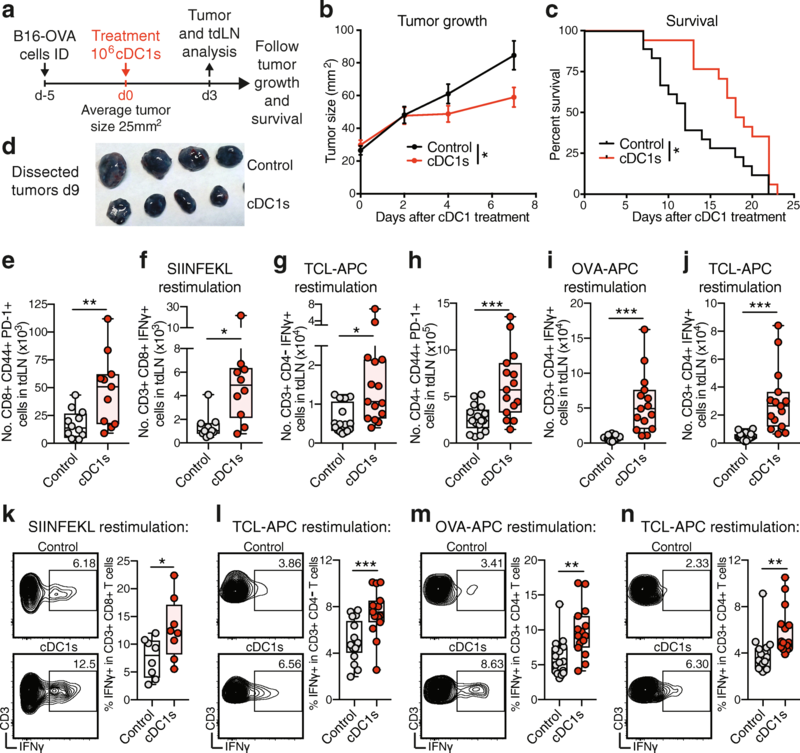 The superior ability of mouse cDC1s to transport tumor-Ag to LNs, cross-present cancer cell-associated Ags and mediate infiltration of T cells in the tumor is established [14, 22, 29, 30, 31]. However, the efficiency of adoptive transfer of syngeneic natural circulating cDC1s for immunotherapy of cancer has not been previously tested. This study reveals the efficacy and feasibility of cancer-Ag loaded naturally occurring mouse cDC1s for treatment of cancer. This next-generation DC vaccine employs: (A) the conventional cDC1 subset purified from tumor-bearing mice that excels in cross priming and elicits the strongest anti-cancer CD8+ T cell responses [22, 44]; (B) the use of poly I:C as an adjuvant that targets cDC1s via TLR3 and induces immunogenic activation, equivalent to adjuvants currently tested for clinical use  (ClinicalTrials.gov identifier: NCT02828098); (C) cDC1-loading with a total tumor Ag preparation based on UV irradiation-induced ICD of cancer cells, a method reported to exhibit superior immunogenic potential [35, 37, 45, 46], releasing HMGB1 and activating cDC1s upon exposure; (D) a convenient route of administration; and (E) a time-efficient, economic and easy-to-use preparation protocol with translational potential. 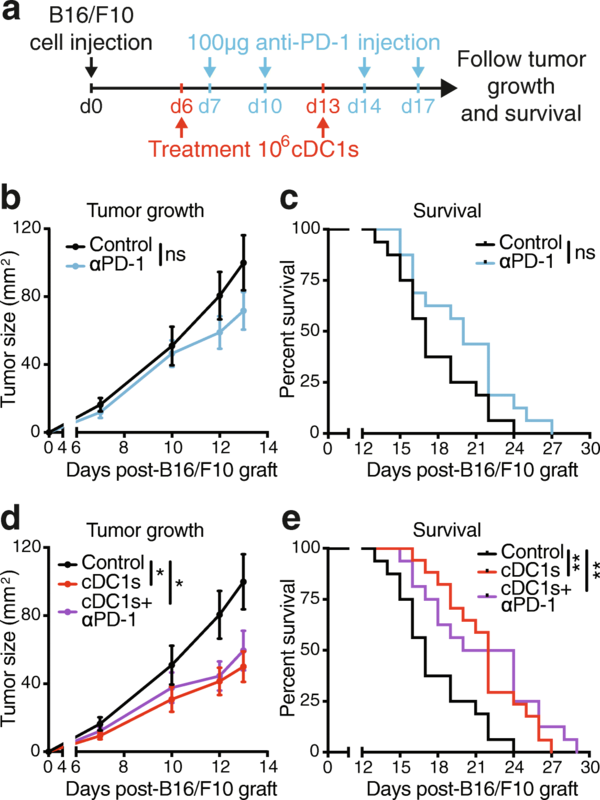 Herein, we establish the proof of principle that mouse natural cDC1s treated ex vivo with adjuvant and tumor-Ag for a very short time are efficient to induce Ag-specific anti-cancer CD8+ and CD4+ T cell responses in vivo. UV irradiation followed by secondary necrosis and generation of TCL from three different cancer cell lines served as source of immunogenic tumor cell Ag for cDC1s. Loading of cDC1s with cell death-induced TCL caused much more effective induction of CD8+ T cell activation than loading cDC1s with soluble protein. This result highlights that UV irradiation-induced TCL not only contains a plethora of tumor cell-associated Ags, but also danger signals like HMGB1 that activate cDC1s and their capacity for tumor Ag processing [35, 37, 40, 41, 45, 46]. Indeed, some cytostatic agents, such as anthracyclines and UV irradiation, induce ICD associated with a spatiotemporal release of danger-associated molecular patterns (such as calreticulin, ATP, HMGB1 and F-actin). Thereby, in contrast to apoptosis that has rather tolerogenic effects, ICD acts as potent stimulator of adaptive immunity, which depends on the presence of DCs [37, 38, 39, 40, 41, 45]. RIPK1 signaling and NF-κB-induced transcription in dying tumor cells also increase cross-priming efficiency and anti-tumor immunity . Cell-associated danger signals associated with ICD like calreticulin promote phagocytosis, while adjuvants such as HMGB1 or F-actin induce DC activation, tumor Ag processing and cross-presentation [40, 41, 45, 49]. This is consistent with our results showing that UV irradiation causes HMGB1 release from three different mouse cancer cells lines and soluble factors in the resulting TCL induce DC activation. Moreover, treatment of natural cDC1s with both poly I:C adjuvant and TCL derived from UV-dead cells is needed for optimal CD8+ T cell cross-priming. 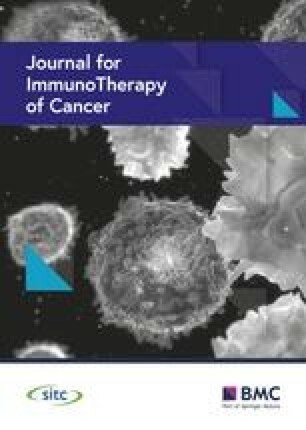 Accordingly, a recent study showed that the combination of poly I:C activation and provision of necrotic cell-associated material caused human BDCA3+ cDC1s to outperform CD1c+ cDC2 and moDC subsets in Ag uptake, internalization and cross-presentation . We have established the proof of principle showing that adoptive transfer of TCL-loaded and adjuvant-activated cDC1s is effective in cancer immunotherapy. However, we intentionally did not compare this therapy with administration of other DC subsets in the mouse system. Apart from the only clinically approved Sipuleucel-T treatment , there is currently no gold standard for DC therapy regarding DC subset, incubation time, Ag and/or adjuvant that would serve for comparison in humans , and less so in mice. Moreover, while cDC1s specialize on cross-presentation of cell-associated Ags in the mouse, the unique functions of the human cDC1 equivalents are also debated [15, 18, 19, 20, 21, 22]. Notably, analysis of several datasets including The Cancer Genome Atlas (TCGA) suggest that a cDC1 signature within many human tumors is associated with improved survival [26, 30, 32, 33]. Nonetheless, anti-cancer effects of DC-based vaccines will likely depend on numerous factors, including the nature of potential Ags available for a certain tumor type (identified neoantigens or tumor peptides, etc.) and, hence, the Ag and adjuvant cocktail used to load DCs. In addition, different tumors may benefit from generation of distinct types of immunity: for instance, a cDC2-dependent Th17 response may be beneficial in certain cancer models .